If you were to stop your average Roman Catholic on the street today and ask them to explain the Solemnity of the Immaculate Conception of the Blessed Virgin Mary today, chances are that you’d get an explanation of the virginal conception of Jesus by Mary and the Holy Spirit. Or, if you’re lucky, you might get an explanation of the idea of the Immaculate Conception of Mary backed up by a confused, or even incorrect, theology. The doctrine of the Immaculate Conception and its festal commemoration each year on December 8th are perhaps the most commonly misunderstood teaching and celebration of the Roman Catholic Church. From the most obvious error to the more minute misinterpretations, here are three of the most common misconceptions about the Feast and Dogma of the Immaculate Conception of the Blessed Virgin Mary and their corrections. This is by far the most common misconception. The teaching of the miraculous conception of Jesus in the womb of Mary by the work of the Holy Spirit is not the Immaculate Conception and is in fact one of the oldest Christian doctrines. It’s a major episode in the Gospel of Luke (perhaps you remember it as “the Annunciation”) and it has a prominent place in the Apostles’ Creed and the Nicene Creed. It is related to the doctrine of the Virgin Birth—Jesus was miraculously conceived and born of a virgin—but it is also central to the theology of the Incarnation (God becomes human and the Word is made flesh) and to salvation (“God so loved the world that he gave his only Son”). And this central teaching of the Church is celebrated annually on March 25th, nine months before Christmas, on the Feast of the Annunciation. Of course, the Feast of the Immaculate Conception celebrates the miracle of Mary’s preservation from original sin at her conception in her mother’s womb, nine months before her nativity on September 8th. The confusion here is understandable, especially when we consider the liturgy: In Advent’s lead-up to Christmas our imaginations are fixed on the coming of Christ and the celebration of Christ’s birth. Of course the celebration of a holy conception would easily be interpreted as the celebration of Christ’s conception. And, more confusingly, the Gospel reading for the Immaculate Conception is the Annunciation, the event of Christ’s conception, from Luke’s Gospel. But this Gospel reading was chosen because we celebrate the Solemnity of Mary’s Immaculate Conception in light of the Annunciation and the event of Christ’s conception. We celebrate how, at the moment when the angel Gabriel announced God’s plan for the salvation of the world to the Virgin Mary and Mary said “yes” to God, this became the pivotal moment in human history and in space and time when God became human, the moment upon which the redemption of the world and the totality of time—all that came before and all that would follow—hinges. 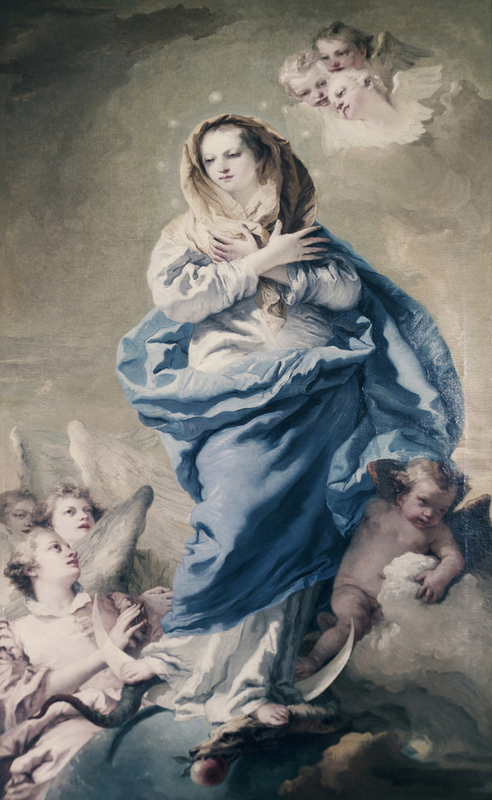 Just as we trace our redemption to this moment, so we can trace the “singular grace and privilege” of Mary’s Immaculate Conception to this unique event in salvation history. A few issues with this common, but incorrect, teaching on the Immaculate Conception. First, the Scriptural argument against this: As Jesus taught, the sins of parents are not passed down to their children (John 9:1-3). Even if Mary were not sinless, at birth or throughout her life, this would have had no effect upon Jesus’ own perfect nature. Second, the issue of sin: Mary was not immaculately conceived (conceived free from original sin) so that she could be a perfect vessel for God to come into the world. She did not need to be free of sin so that her womb wouldn’t accidentally pass it along to the unborn Messiah in the amniotic fluid. This understanding of sin and of the Incarnation is deeply flawed. In the Incarnation, God came into our imperfect, sinful, broken world and took on all of the facets of human life, except for sin. Jesus experienced pain and suffering, he lost dear friends and had cruel enemies, and he suffered and died during a torturous execution. Jesus, who was sinless, still experienced the human effects of sin: death, loss, and suffering. If Jesus could have been adversely affected by sin in utero and required a pristine, sinless womb, then his subsequent life and ministry would have likewise required him to be hermetically protected from the world. But of course the Jesus we know was intimately involved in the messiness of the world. Mary’s Immaculate Conception was not a preventative measure or hygienic requirement for the sinless and miraculous conception, gestation, birth, and fostering of Jesus Christ. And third, the conception of Mary in her mother’s womb was not a prerequisite for the Incarnation and her role as the Mother of God, Jesus Christ; the Immaculate Conception of the Blessed Virgin is, instead, better understood as a result of the salvation of the world initiated at the Incarnation. The Immaculate Conception of Mary should not be understood as a necessary step God took to ensure the Incarnation. If so, as critics of the doctrine of the Immaculate Conception have argued, shouldn’t we also celebrate the immaculate conception of Anne, Mary’s mother? Or the conception of Anne’s mother, and so on, back through history? If we build our theology of the Immaculate Conception around the necessity of Mary’s purity, the logic argues for a prerequisite immaculate conception for each previous generation, like a line of dominoes. Of course, an emphasis on Mary’s sinless nature is still important in our understanding and celebration of her Immaculate Conception when it rightly stresses the unmerited nature of this special grace. After all, before her conception Mary could not have earned the favor of becoming the Mother of God; similarly, none of us can earn God’s grace, only respond to it. But it is vitally important to balance this emphasis by also stressing the saving power of the Incarnation, which not only reverberates through the centuries following Christ’s birth, but also echoes back through time, preserving Mary from original sin at the first moment of her existence. This emphasis rightly highlights the great mystery of the Incarnation and God’s salvific plan and demonstrates how God’s loving mercy is beyond our limited human conceptions of justice and fairness, time and space, cause and effect. Fans of Doctor Who or Interstellar may grasp this better, but in celebrating Mary’s Immaculate Conception we celebrate our salvation in Christ, the effects of which are limitless (not bound by time or space) and the profoundly gratuitous nature of which is beyond our understanding of causation. Mary’s Immaculate Conception did not mean that Mary didn’t need to be saved by Jesus’ death and resurrection; Mary’s Immaculate Conception is, in fact, the first fruit of Christ’s saving work. Her conception is a foretaste of God’s transformation of all of creation: she was born anew, free from sin, through the saving power of Jesus Christ, in a prophetic prefiguring of baptism, in which we are all created anew in Christ’s death and resurrection as God’s sons and daughters. This isn’t so much a Catholic misconception about the Immaculate Conception as it is a frequent, and false, non-Catholic criticism of the teaching and the feast. The dogma of the Immaculate Conception of Mary comes out of the celebration of the Feast of the Conception of Mary in the Middle Ages. The feast of the Conception of Mary, moreover, has its origins in Greek monasteries in the eighth century. As an expression of their deep Marian devotion and informed by the popular apocryphal text The Protoevangelium of James, Greek monks began commemorating the conception of Mary nine months before the feast of her nativity in September. In time this feast spread to the West and was celebrated in Anglo-Saxon monasteries in England in the eleventh century. When the liturgical calendar of these monasteries was altered after the Norman Invasion of 1066, one monk, Eadmer, student of the great scholastic theologian Anselm of Canterbury, argued for the return of the feast according to “ancient” practice, devotion to Mary, and the latest theological methods. For Eadmer, Jesus so loved his Mother that, in addition to preserving her virginity and assuming her body and soul into heaven at the end of her life, he saved her from sin at the beginning of her life. In arguing for return of the beloved celebration of the feast of Mary’s Conception, then, the monk Eadmer was the first person to formulate the theory of Mary’s Immaculate Conception. In time, due to his work and the efforts of Anselm’s nephew Anselm of Bury St Edmunds, the feast returned in England and spread to the European continent. By then, Eadmer and Anselm of Bury St Edmunds’ work had been attributed to the great Anselm of Canterbury, and the celebration of the Feast of the Conception of the Virgin Mary had acquired the theology of Mary’s Immaculate Conception, supposedly backed by Anselm’s reasoning, and bolstered by the European atmosphere of intense and growing love of and devotion to Mary. To some, this development of theology out of liturgical practice and devotion may disprove the validity of the doctrine of the Immaculate Conception. For those of us who study liturgy, however, this is a fascinating case study of how authentic theological development grows out of the Church’s worship and prayer. Just as early Christological ideas developed out of Eucharistic prayers and theologies of sainthood grew from Christians honoring the martyrs on the anniversaries of their deaths, so have all aspects of Mariology come from Christological reflection and popular Marian devotion by the faithful. In the case of Mary’s Immaculate Conception, theology simply had to catch up to the people’s expression of an unarticulated truth: that Jesus Christ became human to save us all from sin, beginning with his Blessed Mother. So, to answer this final misconception: No, neither the Pope nor a legion of theologians “invented” the doctrine of the Immaculate Conception, which we happen to celebrate on December 8th. Rather, the Pope and legions of theologians simply recognized in 1854 (year of the dogmatic constitution Ineffabilis Deus) what had been popularly expressed in the liturgies, prayers, and devotions of the Church for centuries. Perhaps our trouble with the Immaculate Conception comes from our catechesis on the doctrine. When we start with the theology of the doctrine, rather than the celebration of the feast, it all gets rather confusing and can even seem Christologically hollow and anti-scriptural. If we begin by celebrating Mary’s conception in light of our anticipation of Christ coming at Christmas (and again on the Last Day), however, the soteriological elements naturally lead us to a richer understanding of Mary’s Immaculate Conception. Celebrating the Solemnity of the Immaculate Conception today, as for Eadmer in the early twelfth century, makes the most sense when our theological meditations build upon a strong foundation of celebrating the great things that God has done for Mary and for the whole world. This comes from my own unpublished scholarly work on the topic. For more of this history, see Sarah Jane Boss, Mary: The Complete Resource (New York: Oxford University Press), 210-212. Great article, but why is there no reference to the work and theological thought of Duns Scotus and the Franciscan school of theology? Hi Fr. Matt! Thank you! You’re absolutely right that Duns Scotus and the Franciscans were enormously influential in further developing the theology of the Immaculate Conception. I didn’t include them in this short discussion of misconceptions about the Immaculate Conception for the sake of brevity; to include Duns Scotus and the Franciscans would have sent me off on a tangent and I wanted to keep things short. There’s a lot more I’d like to write on the feast and the dogma, so perhaps I’ll include Scotus and the Franciscans in a future post on the topic. Kate – two words… THANK YOU. I was wondering why the Gospel reading in today’s Mass was for the Annunciation or Christ’s conception and not the Immaculate Conception. You explain this and the other misconceptions nicely in a lot of detail.